Researchers at Washington University School of Medicine in St. Louis have identified a pathway in the brain that seems to connect exposure to adverse experiences during early childhood with depression and problems with physical health in teens and preteens. Adverse experiences in childhood — such as the death of a parent, growing up in poverty, physical or sexual abuse, or having a parent with a psychiatric illness — have been associated with physical and mental health problems later in life. But new research at Washington University School of Medicine in St. Louis has shown that multiple adverse experiences in early childhood are linked to depression and physical health problems in kids as young as 9 to 15. Further, the researchers have identified a potential pathway in the brain to explain how such stressful experiences influence poor health in kids. The researchers found that a key brain structure involved in regulating emotions and decision-making is smaller in kids who have lived through three or more adverse experiences before the age of 8, compared with kids whose lives were more stable. Young children who faced multiple adverse experiences also were 15 percent more likely to develop severe depression by their preteen and early teen years and 25 percent more likely to have physical health problems, such as asthma and gastrointestinal disorders. Due to the health problems, these kids were more likely to miss school. The new findings are published Oct. 30 in the journal JAMA Pediatrics. The study involved 119 children, who were ages 3 to 6 when the project began. The researchers tracked adverse experiences in the kids’ lives — which also included experiences such as natural disasters, a parent’s arrest, or a parent with a serious illness requiring hospitalization. The children in the study averaged more than five such experiences before the age of 8. The researchers also performed multiple MRI brain scans of these children when they were ages 6 to 13. The first scans, performed when the children reached school age, showed that the inferior frontal gyrus was smaller in children who had more adverse experiences. The researchers also determined that the structure appears to be part of a pathway through which the stresses of adverse childhood experiences may influence mental and physical health. 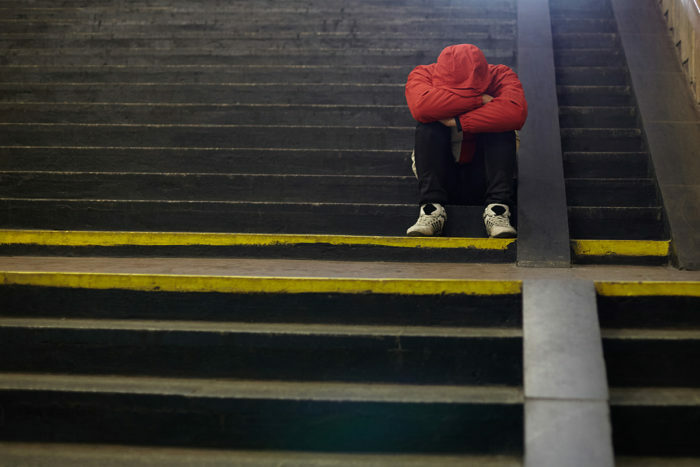 Previous research has connected adverse childhood experiences to problems such as cancer, heart disease and mental illness in older people, but no one had looked at whether those stressful experiences are linked to health problems in adolescents. And until now, researchers had not been able to explain how such experiences could contribute to poor health in these kids. The researchers found that when kids had three or more adverse experiences, they also had smaller brain volumes that, in turn, were associated with lower scores on a scale that measures how well a child expresses emotions. Poor emotional expression has been associated with depression and worse social and emotional outcomes. Such children also had more physical health problems. Parents reported that kids who had more adverse experiences were more likely to have significant health problems that appeared to affect school attendance. 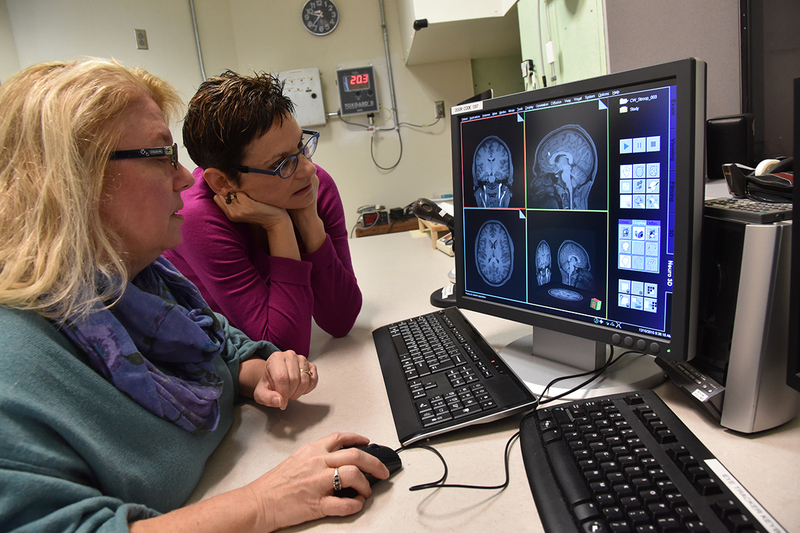 Deanna M. Barch, PhD, (left) of Arts & Sciences and the School of Medicine, and Joan L. Luby, MD, of the School of Medicine, examine brain images from MRI scans of children. In earlier research, Luby, who also is the Samuel and Mae S. Ludwig Professor of Psychiatry, found that kids can be resilient and, with nurturing parenting, may be able to overcome individual stressors such as poverty or the loss of a parent. This new research indicates that when kids accumulate multiple stressors, the experiences pile up and cause problems early in their lives, and family members and doctors need to be aware of the powerful influence of these psychosocial risks so that kids can get the help they need. Luby added that the study could alter the way doctors and researchers think about the development of disease. “We know toxins in the environment can contribute to disease, but this study suggests that kids can experience physical and mental health problems from exposure to psychosocial ‘toxins,’ too,” she said. Luby and her colleagues plan to continue tracking the health of these children as they grow into adulthood. Meanwhile, the researchers also are beginning a multidisciplinary study to follow pregnant women and their infants to see whether psychosocial stressors and adversity experienced during pregnancy and the first three years of a child’s life also affect brain development and overall health.